My first January in Vienna (1989), we only had 26 hours of sunshine the whole month. People were gray-faced and weary and the suicide rate rose significantly. This year is giving 1989 a good run for its money. The sun is shining (sort of) as I write this, but it doesn’t look as if it’s going to stay out, and, indeed, it has already disappeared for a lengthy period once this morning. It may not be all that cold–it’s about 4°C or approximately 40°F–but this weather is not for sissies. I’d almost prefer the 5°F (~ -9°C) with the deep and shining blue skies of my New England childhood. I love shopping at Mastnak on Neubaugasse. It’s the epitome of the kind of specialty store Vienna used to have hundreds of (or perhaps thousands–I’m not very good with numbers). I knew that I could get the Lamy refills because I have bought them there many times. I was less sure about the erasers, but having struck out at Libro (the Austrian equivalent of Staples, where I bought the pencil itself) I thought Mastnak was my best bet. I never should have doubted them. Even though I neglected to take the pencil to show them (Faber-Castell makes a lot of different models) they promptly took me to the right drawer and provided me with a pack of three erasers (the original eraser lasted at least five years so we’re talking fifteen years of use here) for a little over EUR 2. While I was there, I was reminded of the year I decided to use up old candle ends and make my own candles. I remembered how to do that from summer camp, but I had no idea where to get wicks. Well, that arts and crafts department I mentioned, which shares the floor with the pencil erasers–they sell wicks, among many other things. For the record, I am someone who hates to throw out a toaster, for example, because I can’t repair it myself and the repair shop tells me it isn’t worth doing because the repair would cost twice what a new appliance would. I hate being made an accomplice to this wasteful, throwaway society we live in. For that reason, I deeply appreciate how the Mastnak product range and service make it possible to live an old-fashioned economical life, at least in my paper and office supplies. It makes possible a life where things (even old candle ends) aren’t just thrown away but are re-used. As our grandparents could tell us, living economically in that way is also environmentally friendly. You don’t have to throw away the very nice propelling lead pencil because it doesn’t have an eraser anymore. You replace the eraser and get a couple more decades of use and pleasure out of it. And beyond helping people recycle old candles and restore their mechanical pencils, Mastnak helps its customers live an environmentally friendly life by having a whole section of office products made, for example, from recycled paper. They even sell the inks you need to top up those refillable flipchart markers that most people don’t bother to refill, probably partly because it’s not easy to find the necessary ink. Those aren’t the only points that make it a specialty store, though. Their staff know what they’re doing. They know where things are, even though the store is on several floors and has things squeezed into every corner. They understand what you need even from your rather flawed descriptions. And they are helpful. None of the quite common “Das gibt’s nicht” (“There’s no such thing”, which means “I’ve never heard of it” or “We don’t stock it” or maybe even “I’d have to get a ladder to get it down from the top shelf and that is just too much trouble”), which you might hear at other stores in Vienna. At Mastnak, they smile at you and lead you to the thing you’re looking for. How can Mastnak survive, I hear you asking, when they take up time and space with erasers that only cost EUR 2 for a pack of three? For one thing, they sell Mont Blancs, too, and one Mont Blanc probably pays the rent for at least a week. For another thing, the store was crowded when I was there, with short lines at each of the several cash registers. They probably also have a thriving online business. Being lucky enough to live in this city, though, I’ve never used it. Have I mentioned that it snowed in Vienna recently? 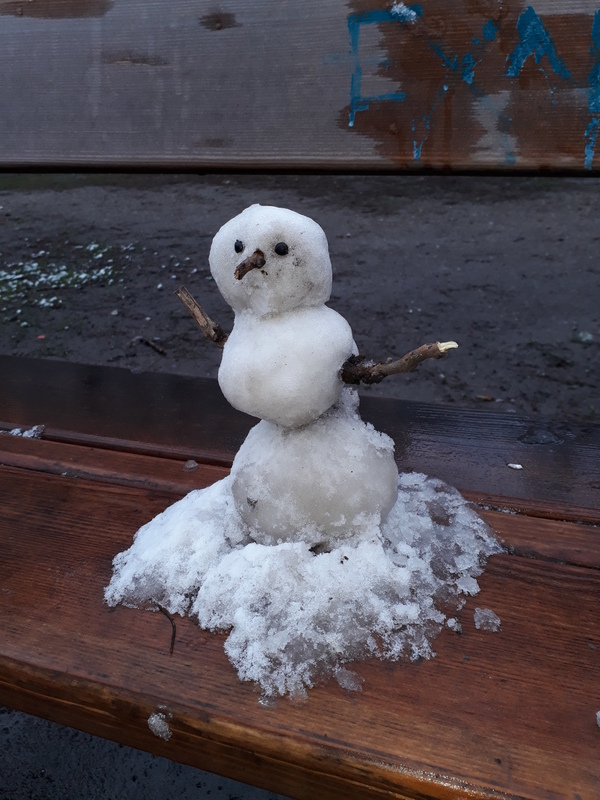 This beautifully crafted and creative snow figure (below) was seen on a bench in the Votiv Park a day or two ago. Just went out with my dog and discovered a large group of Japanese tourists walking around looking somewhat at a loss. It’s Three Kings today and a holiday in Austria and therefore the shops are closed. Poor things. Their tour guide doesn’t seem to have taken that into account. Just because it’s so much warmer this year 5°C (41°F). I’ve been meaning to tell this story for a long time. I find it illustrative of a particular trait especially among old ladies in Vienna, that is, their tendency to comment on things one might think were none of their business. Little old Viennese lady (LOVL): Dog or cat? My friend (MF), with a big smile: Cat. LOVL: How old is he? MF: [!?!?!?!?!] No! He’s too young! LOVL: My dear woman, it is high time!